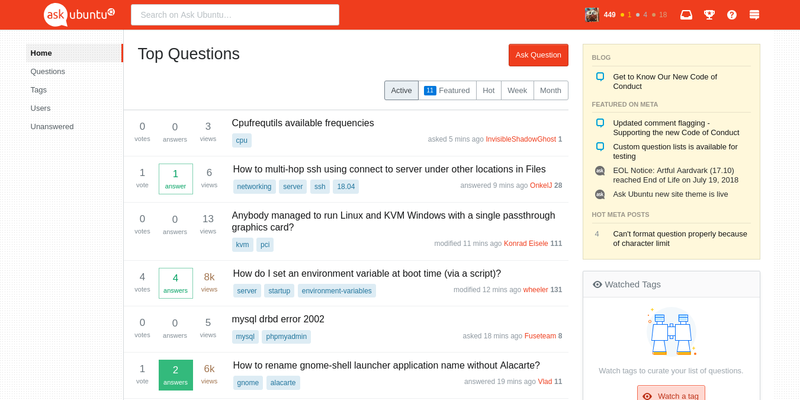 We rolled out the new site theme for Ask Ubuntu. It is now live. You are one of the first sites to get a new, unified theme. I previously posted the designs for theme in meta. The feedback given to that post was considered prior to rolling out the theme. Please help us look for issues/bugs and post the details (including images where needed) as an answer below. 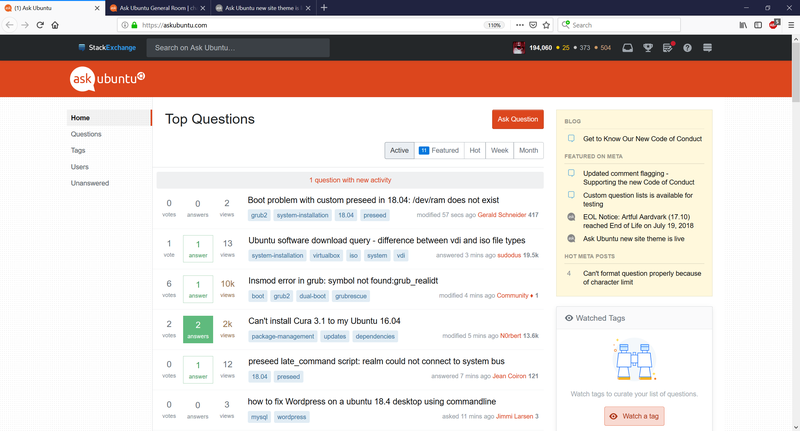 If you have concerns or issues regarding the left nav then this Meta Stack Exchange post is the right place for feedback. 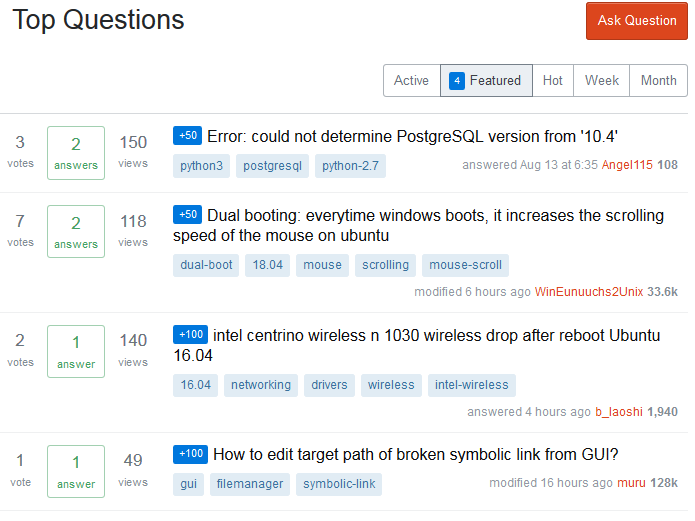 If you have issues with any functionality that is unrelated to the new theme, then please post a new question. I can't tell I'm on Ask Ubuntu once I scroll past our logo. I know there are small visual cues, but the generic .top-bar completely steals my focus and I think I'm on "Stack Exchange". SO has overcome this problem quite simply by displacing the network branding. Why can't we all do that? A few clicks with the Firefox dev tools, gives me something like this. Obviously the text colour needs tweaking to something darker or lighter for contrast. I'd be really surprised if the other sites with strong branding didn't want the same, or to de-sticky the distracting header. Basically my only concern is that the orange header bar is so huge, and yet it doesn't do anything at all. It's as tall as an entire question! 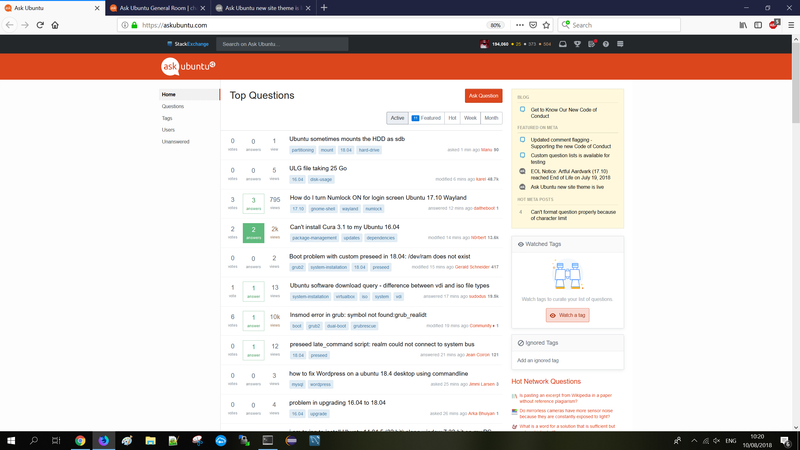 I don't understand why Stack Overflow gets a unified header, but all the other sites are forced into having a second huge block of colour to house their logo. and honestly, I prefer either of those to the current design. The main focus of the page should be the questions. Not the left pane, not the right pane and not the top. The 2 panes are fine. But the top is taking up too much space. I used to have 10 questions on my screen, now I see 6 (well I said 4 but my zoom is now also 1 less than it used to be). From the questions upwards you have a block of white, orange and black with nothing. I believe it would be nicer with 1 "small" change: put "active" up to "month" next to "top questions" and "ask question". That would leave room for 2 maybe 3 questions extra. To small for my eyes and far too much white space left and right. Tested on Chrome and Firefox. Visited question links are not differentiated by color. Previously design had difference between :active and :visited CSS selectors for questions. Without such difference it is difficult to determine visited questions by color. The top-bar isn't sticky for me. It is sticky on U&L, Meta SE and Meta SO. I have custom styles set, but disabling those don't help with stickiness. I have tried toggling the stickiness preference in my AU preferences to no avail. 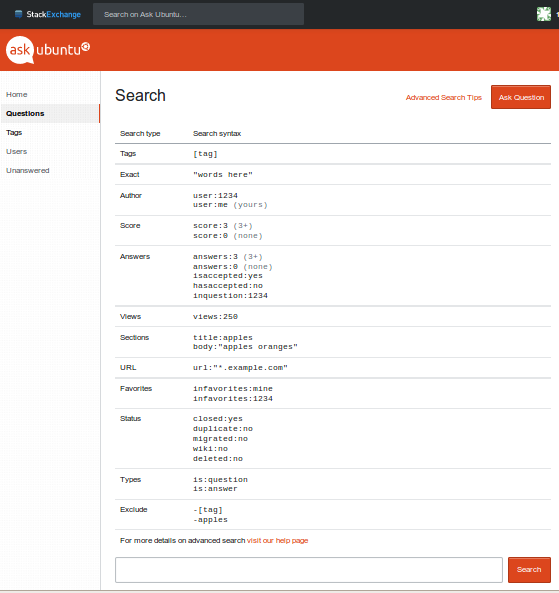 Just visited Search page ( https://askubuntu.com/search ). Clicked Advanced Search Tips and was surprised with location of the tips. They were opened below Advanced Search Tips link. So it is impossible to read tip and apply it to the search bar in the same time. Please move the table of tips to the right as it was before. Today I noticed the color around OP’s profile changed to the red from the blue being used across all SE sites I can think about, regardless of what their main color is. When I first saw it (with another user’s profile), I thought: He’s kinda blocked? No, it seems to be a feature of the new theme. …and maybe other features I haven’t found yet. Shouldn’t the color theme be more consistent? Do we need a tool to help users providing information on their system?